The picture was taken in the "Smoky Mountains" of Tennessee. 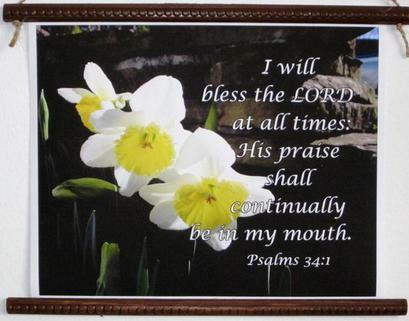 The daffodil is associated with new beginnings because it is one of the first perennials to bloom after winter frost. While cancer survivors have a new beginning on a difficult journey, our desire is that it would be a journey of HOPE! Dimensions 10.5 X 9 inches on canvas. The wood is 12 inches long, with 100% natural #20 jute cord. Price $22 with free shipping! 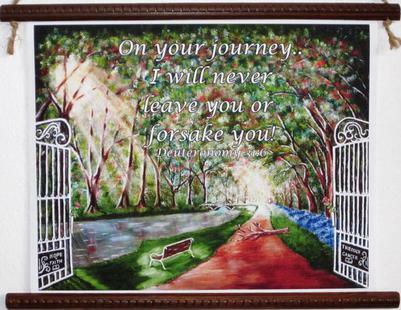 made when Faith (cancer survivor) was diagnosed with ovarian cancer. Dimensions 10.5 X 9 inches on canvas. The wood is 12 inches long, with 100% natural #20 jute cord. Price $22 with free shipping! 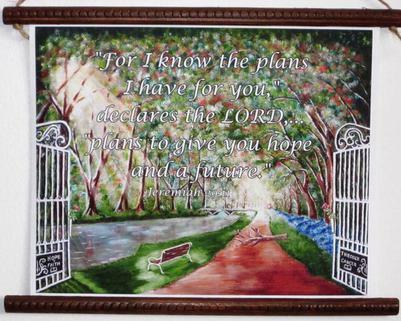 A verse of encouragement on the "Hope Through Cancer" original painting. An artist's perception of a survivor's journey of hope. We are never alone because friends will be there, but most of all God promises to be there. Encourage someone today! Send them a scroll! This photo was taken in the "Smoky Mountain National Park" by one with ovarian cancer. Though, the body was suffering with cancer. 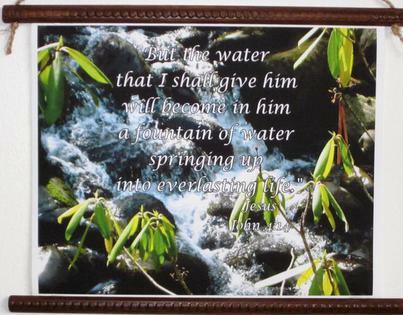 She was reminded by this photo that she had all she needed in her soul to be encouraged and refreshed. All because of God's promises. Please remember that any purchase is your contribution in reaching out to those that have cancer. On behalf of those survivors, we thank you for your support. Let us know that you will pray for this ministry.